We who know him, must follow him in spirit and in truth. We cannot afford to operate within the margins. This is the narrow way Jesus spoke about. At one time God was pleased to use Evangelicals to minister the Gospel to the world; but now the world is in the age of great delusion. Follow Christ, not religion about him, as it all will be burnt shortly. Who Will You Break Faith With? One cannot serve two masters; you will hate one, and love the other. * Gellykill* is short for evangelical, or systematic theologies. Want ANOTHER Reason to Worry about Obamacare??? I always like your posts, they are informative and educated. Having some background in sociology myself, I was surprised to see your reference to America’s Eugenics movement. You are absolutely correct, it is what I personally like to think of as man playing god, or man without a consciousness of God::the results are the same! The mentality that lead Germany to accept Hitler’s ‘final solution’ to the ‘Jewish problem’ has never left the minds of those who consider themselves to be the elite within Western Civilization. It just morphed into another form (this is how evil always operates, and that’s because it cannot survive in the light of day). Today, this mentality thrives in our society, but then, it is only fitting that it should do so since the Germans got the idea for the Holocaust from the American Eugenics movement. This article is for actual followers of Christ in Spirit and in Truth. It is not written to appease or tickle the ears of those who are not serious about following Jesus Christ. You won’t understand this article; if you have not been born again of spirit, as no amount of Bible study devoid of the Holy Spirit, can reveal the “word of God” to those it has not been given to, for understanding. 34 Think not that I am come to send peace on earth: I came not to send peace, but a sword.35 For I am come to set a man at variance against his father, and the daughter against her mother, and the daughter in law against her mother in law.36 And a man’s foes shall be they of his own household.37 He that loveth father or mother more than me is not worthy of me: and he that loveth son or daughter more than me is not worthy of me.38 And he that taketh not his cross, and followeth after me, is not worthy of me.39 He that findeth his life shall lose it: and he that loseth his life for my sake shall find it.40 He that receiveth you receiveth me, and he that receiveth me receiveth him that sent me. My close Elder in the Lord; Brother Justin Hughes, and I were discussing this passage today. The important thing which the natural mind will always reject is the “spirit” in which this passage was spoken. It is inspired by the Holy Spirit of the Lord God, in Jesus Christ. The natural mind cannot receive the things of the spirit of God. So without following the indwelling spirit of Jesus Christ, you cannot (emphatic) hear the word of life. Many examples exist within the scriptures of this principle; Christ told Peter, (before he was born again) that he did not know what spirit he was of! In John 8:43 Jesus told the scribes and Pharisees: Why do ye not understand my speech? Even because ye cannot hear my word. This is also the reason why Jesus often spoke in parables, as it was only for those who would receive the truth of God joyfully. It was NOT for everyone’s ears to hear. Only for those who were elect of God to receive “the word” or the spiritual truth, as revealed to them by the Holy Spirit. In modern western culture, we look at spirituality at best, as being vague and non conclusive. Even worse, most think of it as mystical, or something which is out of the occult. So most avoid walking in the Holy Spirit of God, like it was the plague! Yet Jesus himself taught; that we can only know him in spirit and in truth. We are also instructed in 1 John 4:1 Beloved, believe not every spirit, but try the spirits whether they are of God: because many false prophets are gone out into the world. I have walked with the Lord for over 30 years, been institutionally trained up in sound Bible doctrines, and instructed in theology and church history. Yet none of this training has ever been able to replace the importance of being able to discern what spirit someone is of. Seminaries and institutions of men can only assist an actual disciple of the Lord to walk with him better by instructions of the Elders. An actual Elder, is supposed to be of the same spirit of truth as Christ; by their love for the Lord who should dwell within them, and is more important to them, than anything (or anyone) in the world, including themselves. Yet I am saddened to say that this type of Elder is the rare exception today, rather than the rule. Why is this? It is most often because systematic theologies (church establishments) take precedence in those who want a comfortable life within the world. They compromise the truth of God only found by abiding in Christ, as they do not wish for the aggravation of following him on the narrow road of their lives. Yet this is exactly what Matthew 10; is speaking about! I believe the biggest stumbling block to having the confidence that you can actually discern the Lord’s voice and direction from within you, are false prophets or brethren as spoken about in this passage. Most churchmen, so called men of God, cannot stand for the Spirit of Jesus Christ to testify that he has come in their flesh; of an actual disciple of the Lord. Christ in them, is too close for comfort to a broad roader, who wishes to maintain sovereignty over their own lives or institutions. This was confirmed to me today while in fellowship with an actual Elder, who is gifted, and has the ability to discern spirits. The Lord spoke to this brother in saying “they will not put someone in spiritual authority, (or the leadership) who is of a different spirit than themselves”. That is because in actuality, they are enemies of the cross as Apostle Paul called them; and false brethren, the destroyers of the faith, and the accusers of the actual brethren. As I continue to grow in grace, this type of “institutional religious spirit” (a type of anti Christ) becomes more and more defined to me. As it is by grace alone that my Lord has graciously shown me these truths. (Matthew 11: 25) At that time Jesus answered and said , I thank thee, O Father, Lord of heaven and earth, because thou hast hid these things from the wise and prudent, and hast revealed them unto babes. I have learned these things in my life, because I have hungered and thirsted for the truth of God in my soul, and the Lord has filled me up. He has shown me mercy for I have earnestly sought him with all my heart. He has made right in my understanding all the events which have transpired in my life, because of him who is in me. I am reminded of the verse found in (Exodus 15:26) And said, If thou wilt diligently hearken to the voice of the LORD thy God, and wilt do that which is right in his sight, and wilt give ear to his commandments, and keep all his statutes, I will put none of these diseases upon thee, which I have brought upon the Egyptians: for I am the LORD that healeth thee. As some may know, my physical healing since my near death experience; when Jesus was pushing shoulder to shoulder with me, has been miraculous. My checkups are amazing even to me. Yet the most amazing thing is the healing that has transformed my soul from a once beaten down and broken man in my own strength, to a knowing that I have and will be able to do all things through him that strengthens me. Many accuse me of having a very narrow viewpoint nowadays, yet it is because I chose to follow Christ in Spirit and in Truth. Allowing as little error in, as I am capable of. It is because I hunger and thirst after truth, and not a close look alike to following Christ. In other word’s – I want HIM, as it is Christ alone who gives me fulfillment in life, and the rest can gosling their hooks elsewhere. This is what Jesus called the Narrow Way; and few that it will be who find it. So be not discouraged by broad roaders, wild fundamentalists, nor even Bible scholars who will never encourage you. Nor should you hold back for those who will only come so far with Christ. It is quite evident to an actual disciple in who they are, if we are willing to listen to the indwelling Holy Spirit within us. Many will claim his name, but few will pay the cost in loving only the Lord God, above all else, including their own life, and the lives of others close to them.It won’t make you popular in the world, but you will receive eternal life now, and light to understand and overcome all obsticules. Why Do They Attack Us………? PETITION | Cut Debt, Not Vets – Concerned Veterans for America. Run away big government now targeting veterans and retiree benefits! NO donations are asked for on this site. PLEASE HELP! This video is what people experience who love and follow Christ above all else! It is called SANCTIFICATION, but few will enter in. Is it scriptural: you bet it is, as the scriptures are only written to those willing to count the cost to them in this world, becoming son’s of God (not allowing their lamps to run dry) to be Christ’s Bride. You won’t be his Bride, while you are prostituting against him; no matter how religious’ it sounds! On a personal note: Thanks Justin for making this for me, it is more than I could have asked for! How much history do you really know? Do you research who your voting for? Take the quiz, maybe the outcome might be different in the U.S. NO cheating please. Six trivia questions to see how much history you really know. Be honest, it’s kinda fun and revealing. If you don’t know the answer make your best guess. Answer all the questions (no cheating) before looking at the answers. Fox interviews Rev. 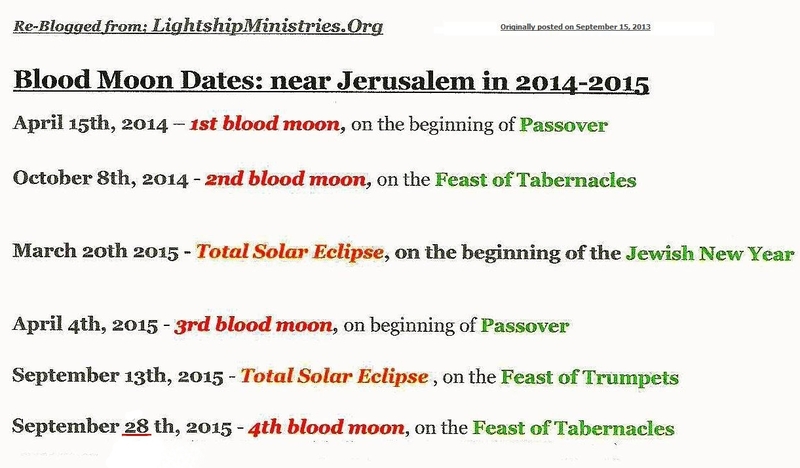 John Hagee on the significance of blood moons and solar eclipses in history; and the significance of the four blood moons in 2014-2015. Filed under Apocalypse Now, Christian informed values.